Gibbons are primates that belong to the family of apes. Their primary habitat is the tropical and subtropical rainforests extending from northeast India to Indonesia and north to southern China, including the islands of Sumatra, Borneo, and Java. They are also indicated as the lesser apes. This is because gibbons differ from great apes; they are smaller in size and their anatomical resemblance is closer to monkeys more than the apes, they exhibit low sexual dimorphism, in do not make nests. Great apes consist of chimpanzees, gorillas, orangutans, bonobos and humans. 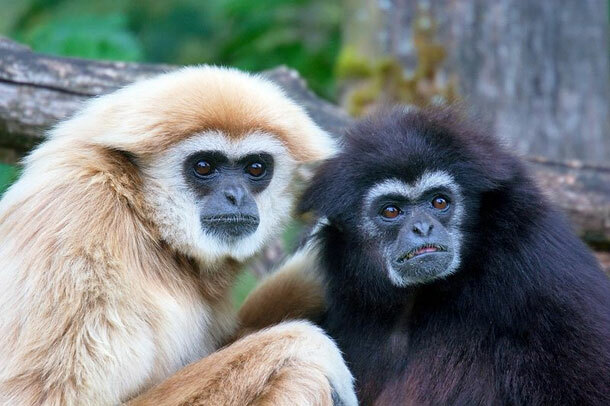 But like all apes, gibbons have too, evolved to become tailless and display pair-bonding. Gibbons are masters in, brachiating for distances of up to 15 m; their speeds can go up to 55 km/h (34 mph). They can also make leaps of up to 8 m (26 ft), and walk bipedal with their arms raised for balance. They are the fastest of all tree-dwelling, non-flying mammals. Their swiftness makes them a difficult prey to hunt. Gibbons come in various color shades from black to dark brown, orangish-brown and light blonde. The colour usually depends on gender and the location and the relative difference of genes. 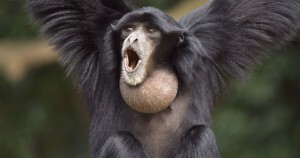 The different species of Gibbon include the Siamang, the White-handed or Lar Gibbon, and the Hoolock Gibbons. Due to the rampant deforestation and senseless abuse of nature and all its elements gibbons are becoming an endangered species. With the depleting forests, omnivore gibbons find it hard not only to find shelter but also food as 75% of their diet consists of vegetarian food. Small animals which supplement as food are hunted by humans and other hunters like fox, eagle, etc or are also vanishing due to lack of shelter. Gibbons are highly social and family oriented creatures. It is a shame to have such a jovial creature in the list of endangered species. 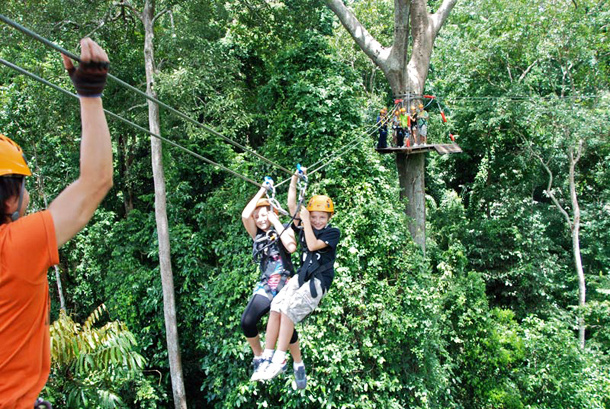 In Khao Kheow Open Zoo we have a special activity dedicated to them, called ‘flight of the gibbons’. It is the longest zip-line activity of 3km in which you spot numerous different species of birds, creatures and of course the gibbons. « Teach Them to Appreciate Life on Children’s Day!